Union warns of health dangers over cost cuts after collapse of UK Coal and closure of Daw Mill Collliery. Hundreds of pensioners across the West Midlands have been granted DOUBLE winter supplies. Hundreds of pensioners across the West Midlands have been granted DOUBLE winter supplies of free coal worth more than £1,000 – thanks to a victorious union campaign. Hundreds of miners fear they could miss out on £18,000 or more in redundancy and pensions following the closure of Daw Mill Colliery. Former pitmen at the last colliery in the West Midlands have revealed that men have lost out on payouts amid fears UK Coal will go bust – and are currently being paid weekly for a 12-week period. UDM and NACODS officials from the North Warwickshire colliery, which was forced to close following a huge underground blaze in February, revealed the financial turmoil. Dave Meuse, Daw Mill UDM branch secretary, said: "May 31 was the end of the 90-day consultation period, during which we were on 60 per cent of basic salary. 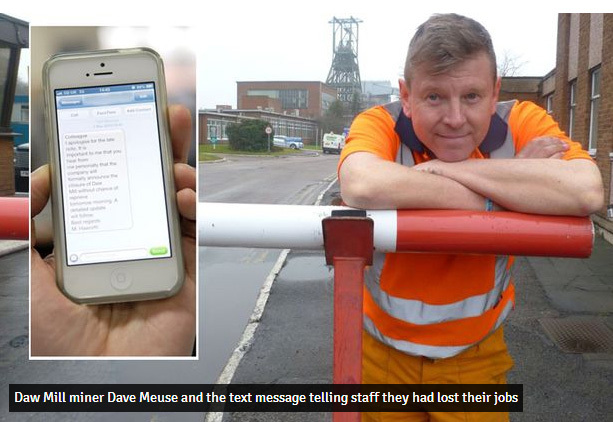 "We got a letter telling us that we were on notification of redundancy. For 12 weeks it is a week for every year of service to a maximum of 12 weeks. "In the past, you have always got a lump sum but because UK Coal have not got the money they have been paying us weekly. The reason they have not paid us a lump sum is because they know that at some stage they are going to go insolvent. If they had paid us a lump sum, it would have cost them a lot of money." Union leaders fear that ex-workers could lose up to £18,000 if they end up with statutory redundancy – and the loss of thousands more from their pensions. John Moffat of NACODS supervisors' union, said: "We realize our mining days are over but we want what we are owed and it does not look as if we are going to get it. People have been in limbo for four months – they are just sitting at home and they are people used to working six, seven days a week." Andrew Mackintosh, from UK Coal said "I am really disappointed at the inaccuracy of some of these comments and totally reject some of the allegations. "We did not want to be in this situation. It is the result of a major fire which cost the company a third of its business almost overnight. "Of the 650 colleagues affected by the closure, we have worked hard to minimise the impact on as many as possible."